“Ich habe eine riesige Discokugel im Kopf und sie hört nicht auf sich zu drehen“, meint Jimmy Somerville. Tatsächlich ziehen sich die Euphorie, die Lebenslust und der Freiheitsdrang von Disco wie rote Fäden durch die Karriere dieser sympathischen schottischen Pop-Legende. Berühmt für seine erfolgreichen Neuinterpretationen von Disco-Klassikern der 70er, hat der charismatische „Smalltown Boy“, auch bekannt als Leadsänger von Bronski Beat oder The Communards, jetzt sein sechstes und vielleicht persönlichstes Album aufgenommen. While working with the record’s producer and friend John Winfield, Jimmy had the idea to turn the songs they were working on at the time into 'disco'. John didn’t need convincing. "We took all the songs and structured them into disco; when we started doing that I realised they were all closet disco songs and they all came to life… it was really exciting” explains Somerville. The album was a ‘family and friends’ affair on which the legendary vocalist had full control, something, he says, that hadn’t been happening since the Communards. "Working with people who have been really been into it, completely supportive and understanding about what I wanted to achieve has been a complete dream – no egos, no drama queens, no divas: just a real commitment and connection to it”. Inspired by music and politics, Jimmy Somerville rose to fame in the early 80s as the lead singer of electronic dance outfit Bronski Beat. Their radio friendly single Smalltown Boy boldly addressed the social issue of gay isolation, while bringing into the spotlight one of the most unique voices of that generation. Following singles Why, It Ain’t Necessarily So and I Feel Love consolidated Somerville’s success. Bronski Beat’s only album The Age of Consent reached platinum in the UK before Jimmy’s departure in 1985. The talented singer went on to form The Communards, enjoying a string of hits from their two albums Communards (1986) and Red (1987). Their single Don’t Leave Me This Way held the no.1 slot for several weeks and went on to become a classic. 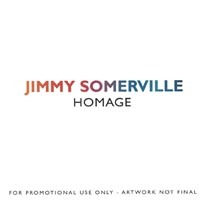 Jimmy Somerville embarked in a solo career in 1989 and released 5 albums – Read My Lips, Dare To Love, Manage The Damage, Home Again and Suddenly Last Summer. Always an outspoken crusader for the gay community, his disarming honesty only contributed to his outstanding achievements throughout the years. 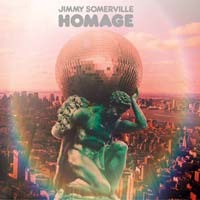 Famous for re-making disco classics as his own - You Make Me Feel (Mighty Real), Never Can Say Goodbye, Don’t Leave Me This Way and I Feel Love to name but a few – Homage was a logical next step in Somerville's career, one at which he can only excel considering his background, passion and undisputed vocal talent.